I was hesitant to make this post because I know many of my readers are outside Kansas City or rather, outside the USA in general, but the majority of you still said you'd like to see a review of some of my favorite coffee shops in my hometown, KC. Coffee shops, to some, are just a place to grab a quick coffee on the go. But, for me, they are so much more than that. I believe coffee to be a form of art and thus a coffee shop is the vessel that creates and nurtures that art. I believe coffee is about slowing down, deep thought or conversation, laughter, or just simply a moment of recharge, a reawakening. That does not mean I am not sitting here right now, writing this, and sipping a smooth cappuccino. A coffee shop can be a place of work too and to me, it is one of the best places to work. You can get completely immersed into your work while letting the coffee and people around envelop you in inspiration and vibrance. To me, going to a coffee shop, is a whole experience not just the coffee. Some of the greatest writers wrote their novels in coffee shops. Did you know that J.K Rowling wrote many of her early novels in a coffee shop in Edinburgh? These are in no particular order, just what I came across first on my camera roll. The first place is Goat Hill Coffee and Soda. This place wins the award for 'tiniest but extra cozy' coffee shop. There are only a handful of seats, so if you're looking to sit and enjoy your brew, you have to be lucky with an available seat. It is located on a lovely street surrounded by lots of homes so, it is nice to people watch if you sit by the window. Perfect for a daydreamer. For me, the thing to order when trying a new place and to see the quality, is to order a cappuccino. I believe a cappuccino to be the best test. It shows the quality of espresso, the grind and roast whether it is bitter and burnt or smooth, and it shows the milk frothing which is very important. The milk should have a micro foam meaning it should be silky and sweet. If you don't froth properly, the milk can be burnt and full of large bubbles that take away from the smoothness and subtle sweetness that milk gives. It should melt right into the espresso. Now, some coffee shops change their beans from time to time and so the flavour will change. The espresso had a very strong sour taste, which for me, I do not enjoy. HOWEVER, my mom loooves sour espresso because she said it reminds her of European coffee. I prefer a more dark chocolate flavour. The milk was frothed very well though and melted into the espresso well. This cappuccino really packed a punch, and with this being the day after I travelled across the ocean, my jet lag needed this. They sell house made sodas as well which I did not try, but the flavours sounded exquisite like blackberry sage. Probably not for a Coca-Cola lover, but certainly a nice treat. I recommend this spot for a quick jolt or if you come at the right time, a cozy spot by the window to write a novel, a thesis, or watch the people going by. Next up, is Oddly Correct. This place is located in a busy part of the city and also has a large window to sit by and look out of as you sip your coffee. It was snowing this particular day and it was lovely to watch from inside. Now, this place used to be strictly a coffee place. This meaning, you could get a cappuccino or a latte, but other than that they just had pour overs and heavily leaned away from coffee with milk, straight black was the way to go. However, when I came this time, things had changed so much. They have pastries to enjoy with your coffee and a few more drinks like a warm chai. This place still focuses on more pour overs than milk-based drinks, but that does not take the wonder out of this place. My cappuccino was delightful. They roast their own beans and the taste was slightly sour with a chocolate overtone. The milk was properly done and sweet. This place has a very eclectic vibe and watching them make the pour overs is like watching art being made, it adds a nice character. The octopus on the wall is a plus, too. I recommend this place for black coffee drinkers because you will no doubt find a good brew. If you want a good cappuccino and enjoy watching pour overs being crafted, this place is for you too. With a name like Quay Coffee, I always seem to think of a bird. This name is fitting for the delicate feel that Quay Coffee has about it. This is popular place for young people with all the nearby apartments and it is filled with cozy nooks to type or chat away. The cappuccino was lovely with a bold yet subtle flavour, as Goldilocks would say, just right. However, the signature here, at least to me, is the Kyoto Cold Brew. I am a cappuccino girl, but during the warmer days I do love a rich cold brew. Cold brew has a much darker and less acidic flavour because it is brewed slowly and without heat. The Kyoto-style contraption is said to have originated in Kyoto, Japan and was actually introduced by the Dutch, who would have thought? I highly recommend giving this a try. 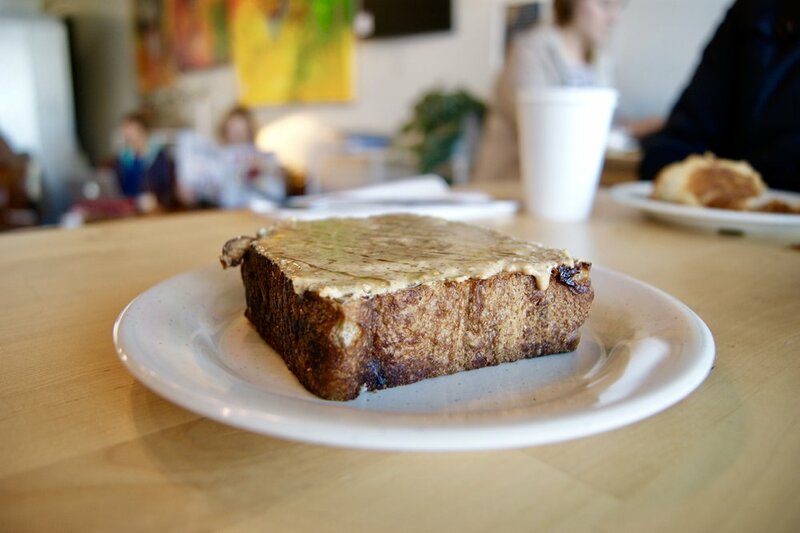 For the most variety, City Market Coffee House is one of the top. It is located at the City Market in a busy part of the city ESPECIALLY in the summer. This place has a line out the door during the summer due to all the market shoppers and people that live in the apartments nearby. This place has a real personal vibe to it meaning they get lots of repeat customers and you can see the warmth as they welcome familiar face. This place has something for everyone and something to suit your every craving. In terms of coffee, there are drinks that I had never heard of such as a cubano and a dirty hippie. It sparks your curiosity. Their cappuccino is good, milk frothed well, however, I wish it came in a smaller size rather than 12 oz. It think the flavour would be a bit better with a smaller ratio. They roast their own beans and their Mexican Oaxaca and Expresso Roast though are fantastic. I bought both and the espresso roast is amazing for making cappuccinos. The Mexican Oaxaca is better for pour over or French Press as it is lighter in flavour. I also tried a Pumpkin Spice Latte from here and before you all roll your eyes, this latte is AMAZING. I am not a fan of overly sweet things, specifically drinks. I am always weary, but decided to go for it and the sweetness was perfect. It had such a wonderful bold cinnamon spice with a hint of cocoa from the coffee in the back of your throat. I could have had 10 more. I highly recommend trying it during the winter and venturing out to any other drinks that spark your interest. They also make smoothies which I also enjoy very much, get the green smoothie or the blueberry breakfast, they are creamy and divine. For the extra sweet tooth, they have milkshakes and for the hungry, they have burritos. They have a two small floors, upstairs is really cozy and extra warm in the winter, the perfect talking or working spot if you can get a seat. It has a very home-y feel, like an apartment in the city. Just because this place is called Second Best Coffee, does not mean it is second in taste. The location of this place may make you skeptical, but trust. Nestled in between a few loan centers and an old nail salon, Second Best is a hidden gem. For those of you who do not know where Kansas City is, it is located in the midwestern United States. Their logo at Second Best is "Midwestern Modesty" and it truly is a place that makes you feel proud of growing up in KC. It has a good atmosphere and with the positioning of the building, the sun beams right through the windows in the morning. The beams fell onto my cappuccino oh so gently as I captured the picture. The coffee was excellent and the milk sweet and silky. The espresso had such a nice chocolate taste, no sourness. This place was filled with friends and conversation, lots of energy and good vibes all around. It seems like the place to catch up with friends and laugh over a good cup of coffee. Come here for a good coffee and maybe bring along some friends or meet someone new. To get to Blip Coffee Roasters, you really have to go on a little adventure to a quite secluded area. Blip is located in the West Bottoms of KC. The West Bottoms use to be a huge area for livestock exchange, but now it is being revived with apartments, antique shops, and the famous haunted houses. Blip is hidden down one alleyway and has a very edgy feel which is perfect for a place that is not only about the coffee but all about motorcycles. It has places to sit, but I actually recommend taking to go. Grab your coffee, but before you head out, look around at all the cool gear and bikes. It's realllly something to look at whether you are a dedicated biker or not. The beauty of coffee shops is that you can give them so much character beyond the coffee, like I had mentioned, it is a whole experience, there is something for everyone. Blip roasts their own coffee and it is superb, not only do they know their bikes, they know how to make a stellar cappuccino. From edgy bikers and now to something a little more cozy. Mudpie Vegan Bakery is one of a kind. It's located on the busy 39th street in downtown KC. It looks like a house and that is a huge part of what makes this place feel like home. Now, I know this post is about coffee, but I need to take a moment to talk about the pastries that they offer. They are INCREDIBLE. That goes for vegans and non-vegans, I have gone with people who are not very familiar of the vegan scene and they loved it. Their pastries are so full of flavour and it's like they hug your soul. I had a pumpkin chocolate chip muffin this day and it was hands down one of the best muffins I ever had. Not dry, not lacking in spice, and the chocolate chips were like extra sweet bursts in each bite. I actually got a chai latte this day with hemp milk instead of coffee because they had a deal for a muffin and chai latte for 5 dollars. It was a little on the sweet side for me and could have used some more punch of spice, but it extra creamy. It also might have been too sweet because I was eating a muffin on the side, but either way, both still delicious. They have a variety of drinks and even more pastries that they make fresh each day. For the vegan readers or those interested, they have a variety of nut milks like coconut, almond, soy, hemp, etc. There are lots of seats including upstairs and I think the view is nice from upstairs. The creaky floors of the old house make it feel extra special, at least to me. Another true gem in KC. Now, again, I have to take a brief moment away from the coffee again and take about bread. I adore a really good bread and Blackdog Coffee House has some of the best bread and this is thanks with their connection with Ibis Bakery who makes it all. The bakery is right there in the coffee shop and you can watch them make bread as you sip your coffee. Their have 4 toast offerings each day and this is their almond butter, honey, and sea salt on cranberry walnut bread which is my favorite. It's an extra thick slice toasted to perfection and is truly warming and comforting. The coffee is brewed to perfection and the milk to espresso ratio is just right with a deep cocoa punch that makes your taste buds sing. This place is usually very busy in the morning, but they have lots of seating and people come and go often so, if you wait a little, you should be about to grab a seat. Artisanal toast plus good coffee? Yes, please. I wish I would have taken more pictures of Messenger Coffee because the location is beautiful. There are three levels of seating with a complete minimalist feel. It feels edgy with a slight softness. The place is filled with large windows and I imagine on a sunny day, the place is beaming. The view all around is incredible because its located in the city which makes it the perfect place to work and chat. They serve Ibis Bakery goods here as well so, you can come here for all your bread-y dreams. The bakery is right in the coffeehouse as well. The signature here is how they serve their espresso drinks. Usually when you order just straight espresso, it is common to serve sparking water on the side to clean your palette. I was surprised then when I received sparking water with my cappuccino. It was a really nice touch and it balanced the strong espresso in my drink. It was definitely a much deeper flavour than I've had, but I was very fond of it. It was still rich and not bitter or too acidic. Come here for a view and that extra special touch. The last place is Monarch which has a completely different feel than the others. Monarch brings a minimalistic elegance that I've never seen in KC before. It feels like a place that belongs in Greenwich village in NYC, but here is this unique gem on Broadway in KC. It recently opened and is growing in popularity quickly. The story behind this coffee shop is incredible. The husband is a well-decorated barista and has travelled the world competing to make the best cup and his wife is talented artist and was in charge of all the interior design of Monarch. This was their dream to unite for many years. It truly is magic how this place was born and you can feel the craft and care in this place the moment you walk in. The coffee is divine and crafted with such delicacy, it blew my mind. The interior feels so elegant and old-fashioned, but with a modern twist. So simple, yet so detailed and thoughtfully created. Come here for that extra care in your cup. I hope that this was a joy to read and you were either inspired to try these places or, if you do not live near KC, that you're inspired to take more care or more interest in your daily cup. Take it all in and sip with dilegence.